The Overview page defines the product and provides hot links to test and export it. A product is an org.eclipse.core.runtime.products extension. At minimum, it must have a name, an ID, a version and an application. The product name is a translatable string that appears in the title bar of the application. 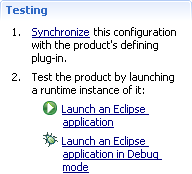 It is defined as a property in the org.eclipse.core.runtime.products extension. The product identifier combo box is populated with the identifiers of all product extensions defined in the workspace and the target. You can select one of the defined products, or you can create a new product definition on the fly using the New... button. The product version is a string that is used to version your product file. A product must be associated with an application, which acts as the main entry point when the product is launched. An application is an org.eclipse.core.runtime.applications extension. The application combo box is populated with the identifiers of all application extensions defined in the workspace and the target. A product configuration can be plugin-based or feature-based. A plugin-based configuration is the default because it is simple and does not force you to understand concepts like features before building a product. A feature-based configuration is more powerful though, since it enables you to deliver a product that is updatable. That is, you can later publish patches or upgrades to your product on an update site and have your customers use the Eclipse installer to download and install these updates. To test your product configuration, just click one of the hot links in the Testing section. Similar hot links are also available in the plug-in manifest editor, but there is a noticeable difference in this instance. There is a Synchronize step. So why is a Synchronize needed? Remember that the product configuration is for PDE use only and is not interpreted nor read by the runtime. Some of the data that enter in this file (e.g. product ID, application, window images, about image, etc.) must be copied to the plugin.xml file of your branding plug-in for these changes to take real effect at runtime. That's what the synchronize action does. It makes sure your plugin.xml contains up-to-date data and in sync with the product configuration. If you use the hot link in this section, PDE does an implicit synchronization of files. If the product is launched via other means, e.g. a context menu launch shortcut, then automatic synchronization does not take place. 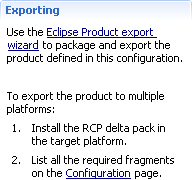 To export an Eclipse product, you can invoke the Eclipse Product Export wizard via the hot link in the Exporting section. To export a single product configuration to multiple platforms, you need to have the RCP delta pack installed. It is available for download from the same place as the Eclipse SDK. The RCP delta pack contains all the different platform-specific fragments needed for all supported platforms. Once the RCP delta pack is in the target platform, PDE detects the presence of the org.eclipse.equinox.launchers feature and enables the cross-platform export mode. 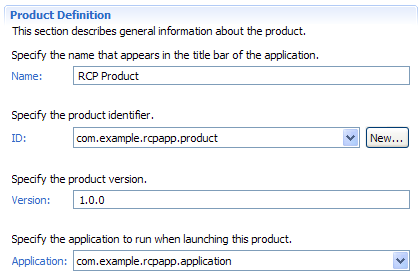 Note, to use the RCP delta pack, you have to ensure that the 'Build target platform based on the target's installed plug-ins' option remains unchecked in the Target Platform preference page.